Amelia Earhart was one of the pioneers of modern aviation, a best-selling author, and a revolutionary feminist who enjoyed enormous celebrity during her life, and whose tragic death in 1937 remains shrouded in mystery. From her humble beginnings in rural Kansas in 1897, she rose to become one of the pre-eminent women of her generation; she became the first woman to fly solo across the Atlantic Ocean in 1932, was a member of the engineering faculty at Purdue University in Indiana, and was in the middle of an attempt to circumnavigate the globe when she disappeared over the Pacific Ocean. Director Mira Nair’s film of her life – Amelia – stars Hilary Swank as Earhart and Richard Gere as her agent and husband George Putnam, features Ewan McGregor, Christopher Eccleston in supporting roles, and boasts a rich, sweeping score by French/Lebanese composer Gabriel Yared. It’s been a tough few years for Gabriel Yared in terms of his mainstream profile. Since the now-notorious rejection of his music from Troy in 2004 Yared has scored just one American film, the Stephen King horror movie 1408 in 2007, and has instead been working predominantly in the European film industry, on projects such as the Oscar-winning The Lives of Others, Breaking and Entering, and L’Avion. Whether he was blackballed by the studio system for speaking out about his frustration over his rejection, or whether he chose to take a step back from Hollywood because of his dissatisfaction with the political shenanigans within the industry is unclear, but it’s great to see him back writing music for prominent films again. Written for a full symphony orchestra, with special emphasis on romantic strings and tender pianos, Yared’s score for Amelia is a delight. It’s a monothematic score, with the central theme recurring constantly throughout the album’s 53 minute running time. It’s a good theme – a recurring nine note melody which simultaneously captures Earhart’s romantic, free-spirited nature, as well as the nobility and bravery of those early ground-breaking aviators. Although clearly modeled on John Barry’s famous theme from Out of Africa, it has enough of a distinct personality to stand on its own, and each appearance of the theme gives the score an enormous lift. If forms the core of the opening “Introducing Amelia”, when it is passed beautifully from strings to warm brasses. It has two subtle, almost dreamlike recapitulations for solo piano, gossamer flutes, whispering strings and reedy Arabic woodwinds in “Amelia and George” and “Radio Love Call”, with the Arabic-style woodwinds acting as an unusual recurring motif for Amelia and George’s unusual on-again off-again relationship. A cheeky variation of the main theme appears in “Flying with Eleanor Roosevelt”, which begins as though being played on an old fashioned gramophone, complete with crackles and distortions, before emerging into modern stereo, bringing the gently mischievous dancing woodwinds and plucked strings to life. The solo piano takes on a sultrier, more romantic tone in the exquisite “No Longer a Passenger”, and has a wistful air of calm resignation at the end of “Final Flight”, before receiving its most tender performance in the unashamedly emotional “Amelia”, which beings the album to a close. The score’s secondary theme is a sort of anticipatory ‘Sprit of Adventure’ 4-note motif, and is actually the first thing you hear in the score, at the very beginning of “Introducing Amelia”, and appears regularly throughout, most notably at the beginning “Call of the Wild”. There are also a couple of moments of lively, sprightly scherzo-like dancing, with metallic percussion and effervescent string writing. Once in a while Yared also makes use of an exotic, African-style woodwind element, performed mainly on breathy flutes, in cues such as “Vagabond of the Air”, where more often than not it is used to add a dash of local color to Amelia’s sun-kissed journey across the Sahara, and then the vast plains of Asia, during her ill-fated circumnavigation. The action and suspense music, in cues such as “Flight to Wales”, the second half of “No Longer a Passenger”, “Hawaii Crash” and the elongated, conclusive “Final Flight”, is nervous and insistent. Usually anchored by a bed of rattling percussion, pizzicato strings, and intense brass chords, and overlaid with one of the main themes, it allows the more dangerous moments of Amelia’s life to be brought into stark focus. “Flight to Wales” also incorporates a clever creaking effect, clearly alluding to the less-than-solid nature of her comparatively primitive aircraft. The music for Amelia has received a great deal of criticism from the mainstream press. Lisa Schwarzbaum from Entertainment Weekly called his music “as distracting as sirens” and an “intrusive messenger”, while Peter Travers in Rolling Stone called it “sudsy”, and Justin Chang in Variety called it “hyperactive”. As I clearly state my review, I thought it was absolutely lovely. It’s an unashamedly old fashioned score, and by that I mean it wears its emotions defiantly on its sleeve. When Earhart’s planes take flight, and she feels a rush of elation and freedom and spaciousness, the music feels it too. When she feels romantic longing, the music is right there with her. When she is in danger, with her plane rocking through storms or coming perilously close to running out of fuel, the music mirrors her apprehension. Surely this is what film music is supposed to do? It’s not sudsy, it’s not hyperactive, and it’s not intrusive; it allows the viewer to get swept up in the emotions of the piece, giving the film a broad canvas, and a cinematic quality that is sadly missing from too many of today’s films. It makes me so annoyed when “mainstream” critics come down hard on films which feature music with prominent themes, romantic orchestrations, and direct emotional content. They say they feel like they are being manipulated by the music into feeling these emotions; I say, if you don’t want to feel these emotions, why do you watch movies? Possibly the one thing holding Amelia back is its lack of thematic variance; the main Amelia theme really is the only thing holding the score together, and if its lushness and broad romance comes across to you as too saccharine, then the whole score will fall down with it. Other than that, though, I fail to see how this score will not delight fans of scores with an old-fashioned feel. It has a similar tone to earlier Yared scores such as Message in a Bottle and Possession, and fans of those works, or of John Barry’s sweeping romance work, will find their tastes catered to here. 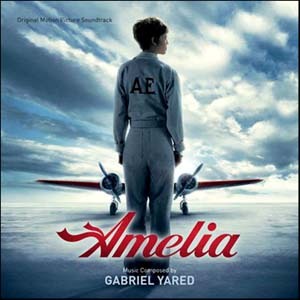 Music composed by Gabriel Yared. Conducted by Jeff Atmajian. Orchestrations by Gabriel Yared, Jeff Atmajian and Kirsty Whalley. Recorded and mixed by Peter Cobbin. Album produced by Gabriel Yared.